Posted May 12, 2010 by Emmet Farrell in News. 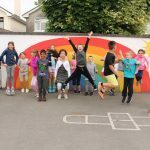 Claregalway Educate Together has been open since 2005. Every year elections are held in October for our Student Council. Many issues are discussed and fund raising events are undertaken for local charities and for disaster hit areas of the world. Currently the students feel very strongly about safety on the bridge near our school. Some of our students and staff use this bridge daily. At the moment they take their lives in their hands. At a time when schools wish to encourage children to walk or cycle to school, it is actually with trepidation that the staff of the school watch these children walk across the bridge. Class excursions to and from venues in Claregalway are seriously curtailed because of the lack of safety. The Student Council held meetings and decided to start a petition to make people aware of the danger this bridge poses to all pedestrians in Claregalway not just our students. A footbridge would benefit everyone in Claregalway. It would provide safe pedestrian access to Claregalway Cemetery, the Abbey and the SMA House for people from Claregalway. outside Hughes, on Wednesday June 2nd from 10am -12pm. All our local representatives will also be notified. Our own school community have already signed the petition, some of our past pupils even thought of bringing it to their second level schools. Some of our parents took it to their places of work; they felt so strongly about it. I write to you to ask for your support for this badly needed footbridge. Please give the students your support on the day or call to our school to sign the petition this month.